The water stability of fish feed pellet refers to the performance of keeping constituent from dissolution and diffusion after fish feed soaking in water for a certain period time. In general, stability is indicated with the ratio of fish feed diffusion amount and quality in water per unit time, or with the minimum time without diffusion for fish feed in water, which always requires the diffusion rate of fish feed less than 20% (soaking for 30 minutes). The particle size of fish feed has a significant effect on the stability. 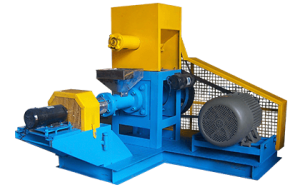 On the one hand, if the fineness of pulverization is large, it is easy for water to permeate pellet feed and cause scattering; on the other hand, grinding particle size also has definite influence on process flow, such as mixture and tempering steam, etc. While small particle size can make raw materials sufficient and even mixing, in favor of material tempering, stimulating natural binder component for better bonding effect, and meanwhile, the swelling property of material is close to accordance, all of which assist in obtaining better stability in water. As raw material granularity determines the surface area of feed composition, the thinner particle size, the larger surface area and the stronger ability to absorb the moisture in the steam before granulation, which can prolong the dwell time in fish body, promote the absorption effect and reduce water pollution. In general, after grinding, fish feed raw material should pass 40 mesh standard sieve and less than 20% oversize product for 60 mesh standard sieve, while prawn feed raw material should pass 60 mesh standard sieve. 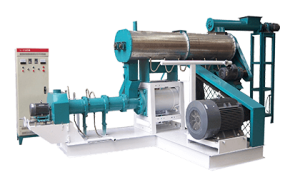 Through adding steaming to soften materials with more plasticity, the materials are easy for extrusion forming, thereby enhancing the granulating function of fish feed pellet extruder. Moreover, water stream heat can make starch of bait full gelatinization, make protein denaturation and help starch turn into soluble carbohydrate so as to improve digestive utilization ratio. Moreover, the improvement of granule density brings bright and clean appearance that is uneasy to be eroded, increasing stability in water. Additionally, high temperature function during tempering process can kill the harmful germs like colibacillus, salmonella and so on, raising the storage properties of products and beneficial to fish health. Binding agent, the peculiar additive with the bonding and molding function for fish feed, can be broadly separated into two categories: natural substances and chemical synthesis substances. The former can be divided into saccharides (starch, wheat, corn flour and the like) and animal gels (bone glue, hide glue, surimi and so on) according to ingredient, while the latter can be divided into carboxymethylcellulose and sodium polyacrylate, etc. In the process of fish feed production, moderate binding agent can advance the stability of feed in water. Some raw materials can increase the stability of fish feed in water, so the larger proportion they are in feed formula, the better stability feed will have, otherwise, the stability in water will be worse. When designing formula, fish feed producers should follow the below principles: First, for those same type raw materials, try to choose the one with stronger stability, for example, choose flour among flour, corn and rice bran, choose cottonseed meal among cottonseed meal and rapeseed meal, and choose fish meal among fish meal and silkworm chrysalis. Second, for the same raw material, its water tolerance and freshness are also different, choose the one with stronger water resistance and better freshness. Third, try to choose raw materials with animal protein under the circumstance of cost permitting because animal protein has better granulating efficiency than plant protein. Under high temperature and high moisture conditions, starch is easy for past-forming, becoming one of the important raw materials influencing fish feed stability in water. Because the requirement for fish feed protein level is higher, there are some limitations for the dosage of starch-type materials and the appending proportion should not be too big. During production process, adding moderate flour can be conducive to improving pellet feed stability in water, but due to the higher cost of superior flour adding, so it’s common to add 13%-15% wheat shorts in the actual production. The crude fiber content in fish feed should be controlled within 3%-5% so as to enhance water tolerance, but for the crude fiber content in herbivore fish mixed feed could be duly higher, specifically, feed for fingerling should be controlled within 8 percents and feed for adult fish should be controlled within 12 percents. Considering the feeding habits of fish and the requirements of bait stability in water, usually, fishes with slower ingestion need higher stability while fishes with faster ingestion need lower stability. Considering the property, suitable quantity and cost of binding agent. Considering the interaction effect between adhesive and feed to see if nutrient content would be broken. Considering the nutritive value of binding agent and its influence on fish growth and livability. Practice indicates that the binding agent of agricultural and sideline products (like wheat gluten, rice gluten, α – starch and wheat shorts, etc.) have good cohesiveness that can produce good stability in water; attapulgite and bentonite also have better cohesiveness and a certain amount of mineral element, suitable for low price feed with low stability in water. 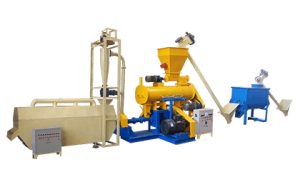 The product granularity largely depends on whether the grinding equipment is fitting or not, so choosing the suitable fish feed mill is quite crucial if feed producers want raw materials to achieve perfect fineness. In order to avoid bad particle size caused by improper grinding equipment, FANWAY has launched 9FQ series fish feed hammer mill with high performance in grinding production, power consumption and pulverization process, which makes particle size more guaranteed. Lots of feed plants use steaming for tempering, that is, directly putting steaming into ready-prepared materials for hydro-thermal treatment. Therefore, it is of vital importance to control the speed of feeding well and choose the time, temperature, pressure and water content of tempering well. Most often, feed producers use fish feed cooler machine for cooling, and the temperature of pellet just discharged from cooler is 6-9 degree Celsius higher than indoor temperature and the water content after cooling is 12%-12.5%. In process, cooling time and air amount should be chosen depending on materials, pellets feature and fish feed cooler types, but in general, pellet temperature after cooling should never go above 3-5 degree Celsius than indoor temperature.